Have I mentioned how much I love this book?? Purchased on a memorable trip to Dublin with my brothers, it is a much thumbed volume round these parts. 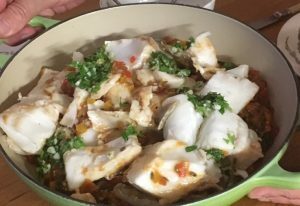 We were long overdue a visit from David and Andrea and I fancied something fishy for dinner, so I picked Itzi’s stew of cod with pepper and fennel seed, which looked very promising. Apparently Itzi is a friend of the folks at Brother Hubbard – I love her blog about food, life, all that kind of stuff. Place a heavy bottomed pan over a medium heat. Add 2 tablespoons of olive oil, with the peppers, onions and garlic. Cover and reduce the heat to medium-low and cook the vegetables for 10-15 minutes, until they’re soft, then add the fennel seeds. Uncover, add the wine and turn the heat up and stir. Add the tomatoes and season. Stir again and simmer for about 8 minutes. Meanwhile, make the gremolata, by mixing together the parsley, garlic and lemon zest and juice. Put the cod fillets on top of the vegetables and cover. Check after 8 minutes – don’t let it overcook. Remove the fish and keep it warm. Add the spinach to the sauce and stir. Check the seasoning and maybe add a squeeze or two of lemon juice. Brother H recommends serving this with wedding couscous, about which I have waxed lyrical before,. Time was not on my side, however, so I opted for some crusty bread (not homemade on this occasion, and therefore not pictured, but I must get back in the bread baking saddle again soon) and green beans with tarator (another Brother Hubbard delight) – this is a sauce made of stale bread (there’s always some of that in the freezer), almonds, garlic, lemon juice, olive oil, natural yoghurt, salt and pepper. I chose to make it reasonably runny, so we could pour it over the beans, which I cooked for just a couple of minutes to keep them fresh and bright green. I loved it and, as recommended by the Brother, used the leftover sauce with some broccoli the following day. I chose a different book for dessert – Tonight at 7.30: one family’s life at the table by Kristen Frederickson and Avery Curran. I’m slowing discovering the joys of this book. 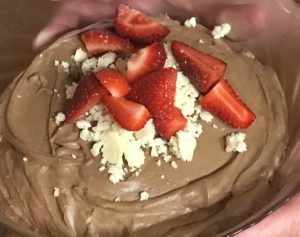 Rosie’s celestial chocolate amaretto mousse is magnificent. It’s a bit of a fiddle to make and I didn’t have time to give it the recommended overnight/eight hour chilling, but it didn’t seem to be a problem. Missy B wasn’t overly keen on the crumbled amaretti biscuits, but I thought it was a great combination and well worth the effort of much whisking of this, that and the other. On the basis of the tiny amount left at the end of the evening, so did the guests. Silky, delicate and so so moreish. It seemed ungracious not to go along with Kirsten and Avery’s suggestion that I served serving with a glass of amaretto. Served with strawberries in the interests of our five a day.